I come from a long line of immensely talented singers and musicians. My great-grandfather Søren Christensen played at least six different instruments (including the wooden concert flute) and performed under the direction of John Philip Sousa. My grandfather Charles Harmon Ginn was frequently featured as a baritone soloist on NBC Radio in the late 1940s and early 1950s. My father David is also an excellent baritone singer and a pianist. As a kid, I expected to follow in my family's musical footsteps. I started on the piano at four and began playing the trombone in the school band at eleven. I spent my teens and early twenties playing in school bands and orchestras, jazz bands, and youth symphonies, but when I moved to Santa Cruz, CA at age 15, my musical passions took an unexpected turn. There, my friend Lee Martin introduced me to Jay Salter, a local bagpiper, and I soon began taking lessons. 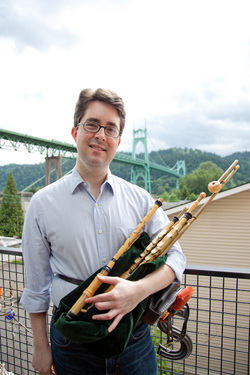 Within weeks of starting on the practice chanter, Jay told me about a house concert featuring a friend he described as a "piping master" from Scotland. Attendance was mandatory. Picturing in my head some distinguished, white-bearded gentleman in a kilt, when I arrived at the concert, I was surprised to find a man with fiery red hair bursting from a Moroccan skullcap and dressed in a ripped up t-shirt and jeans rolling smokes on the deck. It turned out to be Hamish Moore, and over the next few hours, he played traditional Scottish music on a variety of Scottish pipes that entranced me like no other music had before. I was hooked. Over the next few years, I continued to study with Jay and was fortunate to attend workshops with several fantastic Scottish pipers including Anna Mhoireach, Rory Campbell, and P/M Jimmy McColl. I also began to study Scottish Gaelic with Rev. Peter Webber, a Glasgow native and fluent Gaelic speaker whose mother's family were Gaelic speakers from Argyll. While in college, I studied abroad at the University of Glasgow and also studied Gaelic at Sabhal Mòr Ostaig on the Isle of Skye, Scotland's only Gaelic-medium institution of higher learning. During this time, I was incredibly fortunate to study piping with Allan MacDonald, Scotland's most talented and musical exponent of ceòl mór. In addition, I continued to study ceòl mór with P/M Jimmy McColl through tape exchanges, and these tapes remain prized possessions of mine. The generosity of these two men in sharing their immense knowledge with a young learner left a tremendous impression on me, and I will always be grateful to them. Santa Cruz in the late 1990s was a surprisingly good place to be learning to play Irish and Scottish traditional music, and I was surrounded by other very talented young musicians including David Brewer, George Grasso, Theo Paige, and Jesse Autumn among others. All of them continue to play leading roles in the traditional music scene in the U.S., Ireland, and Scotland. Through playing with them, I first took up the whistle and then at 18, the Irish wooden flute and began to focus more on playing Irish traditional music. While spending a summer living in the West Kerry Gaeltacht in 2000, a chance encounter with renowned piper and pipemaker Cillian Ó Bríain led to acquiring a set of uilleann pipes, the instrument which today is my primary focus.